Xinhua News via TwitterNorth Korean leader Kim Jong Un with Chinese President Xi Jinping. 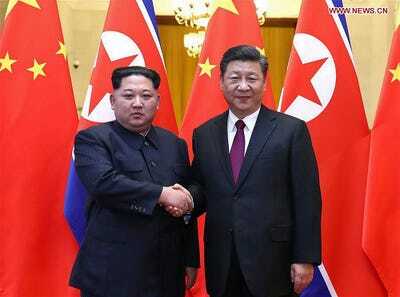 Kim Jong Un appeared to bury the hatchet with China during a meeting with its president, Xi Jinping. The meeting came after a massive pressure campaign on his country initiated by President Donald Trump. Kim has never faced a US that threatens North Korea as credibly as it does under Trump. That real fear of nuclear war has motivated actors around the world to take action against Pyongyang. When Kim Jong Un met Chinese President Xi Jinping in Beijing this week, two weeks after agreeing to meet with President Donald Trump, he came out of the shadows to make history. Since Trump took office, Kim has overseen a series of North Korean firsts. North Korea tested its most powerful nuclear device yet and its first intercontinental ballistic missile, and it has now conducted its first leader-to-leader act of diplomacy. But Trump has also offered up a first – the first credible threat of military force against Pyongyang. In his first year as president, Trump made a series of military overtures and outright threats to North Korea that undeniably put the region on edge. Facing a deeply unconventional and unpredictable US president, North Korea must have felt some of the heat too, as it reached out to Republican strategists and eagerly analysed Trump’s tweets and statements while seeking to know what to make of them. But as the fear grew, so did international cooperation. Trump’s “maximum pressure” strategy against North Korea has brought unprecedented cooperation from China and Russia, Pyongyang’s major backers and two parties that desire stability in the Korean Peninsula. Now Kim, motivated by crippling sanctions with his nuclear weapons program at a comfortable resting point, has changed his tone. Kim is setting up talks with South Korean President Moon Jae-in and Trump, but before then China wanted to get a word in. Experts tell Business Insider that China is anxious over the prospect of talks progressing without it, possibly at the cost of its national security interests. Historically, China does not like North Korea under Kim’s leadership. Kim has killed members of his own family over their ties to China. Kim was in power for seven years before travelling to Beijing, and he appears to have made that mood only hastily now that talks, or confrontation, with Trump loom. China, Japan, South Korea, and even Russia are now seeking to get in Kim’s ear ahead of his meeting with Trump. Will Trump soften up once he talks to Kim? Maybe, maybe not. Pool via Getty ImagesPresident Donald Trump in January. The prospect of dialogue has done nothing to make Trump’s threat of military action less credible. In fact, by dismissing an already hawkish national security adviser in H.R. McMaster and replacing him with the ultra-hawkish John Bolton, who frequently advocates military action against North Korea, Trump’s threats may have only grown more credible. Bolton has repeatedly suggested that if talks between Kim and Trump are anything less than Kim discussing how and when he’ll dismantle his nuclear weapons, the US will simply walk out. 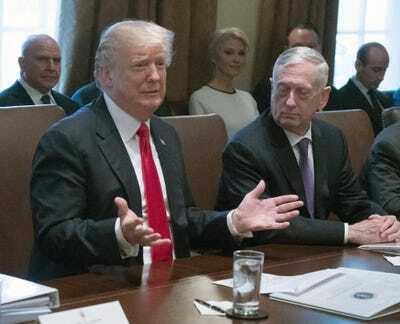 With the State Department understaffed to the point of near hollowness, Trump appears to have little to lean on besides his credibility in initiating war. As long as Trump’s threat remains credible, he’ll retain leverage in talks and in building international support for further sanctions on North Korea. If the talks do fail catastrophically to create any road to peace between the US and North Korea, Trump can then ponder military action against Pyongyang, knowing that in the eyes of the world he’s come closer to a North Korean leader than any other US president.